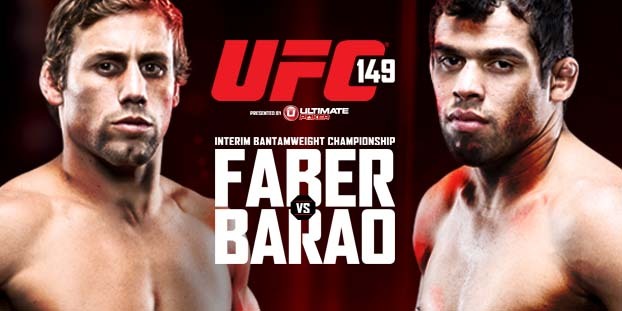 Tomorrow night Al’s coach from this season of The Ultimate Fighter Urijah Faber will take on Renan Barao for the interim Bantamweight Championship. The fight was originally scheduled to be between Faber and the coach that opposed him during the show, and current UFC Bantamweight Champion Domminck Cruz, but Cruz was forced to withdraw from the fight after tearing his ACL. Cruz will likely fight the winner of this fight once he’s ready to return to the octagon. Just as all of Iaquinta Nation has shown Al support in all his fights, make sure you support the California Kid Urijah Faber this weekend in a big Bantamweight title fight. Here’s Al’s fight predictions for UFC 149. Lets hear your predictions.